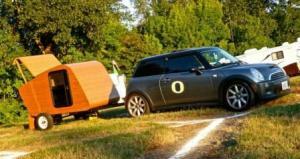 From Zenbox Design: A lightweight bamboo-clad mini camper. Towed by a Mini Minor. With a skylight to see the stars at night. More images at Zenbox. The dog looks happy. Bamboo yarn got a mention here recently. I hadn’t thought of it before, but bamboo yarn is not only soft and silky, it’s vegan too! The PETA blog assures us that no cruelty is committed by using bamboo yarn. 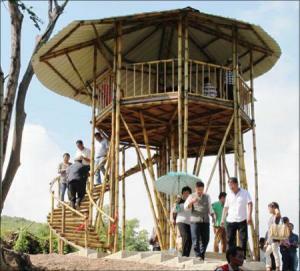 The Nagaland Bamboo Development Agency constructed a bamboo bird watching tower near Doyang as part of a bamboo promotion campaign. 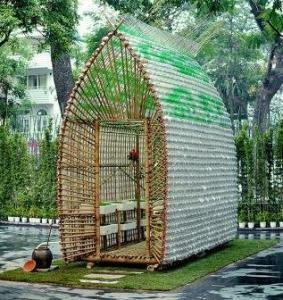 Green Building Elements this month featured a lightweight greenhouse built from plastic drink bottles and bamboo – architect designed, no less. This one is now in operation on a farm near Hanoi. A virtual bamboo forest even noisier than the bamboo forest at Damyang. More awesome bamboo architecture in Vietnam. 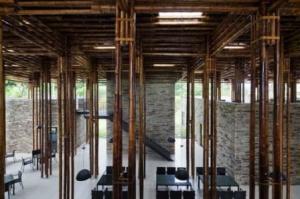 This 750-seat hotel restaurant in Son La uses a local bamboo called Luong that grows to 8 metres high. 96 bamboo column units composed of 4 bamboos together induce the vertical expression of the bamboo structure like bamboo forest. The bamboo was treated in a traditional method by soaking in it mud and then smoking it. I highly recommend a viewing of the other images on the Arch Daily website. This entry was posted in All, Bamboo around the world, Bamboo on the Internet and tagged architecture, art installation, bamboo, campers, handicraft, India on 01/11/2014 by Deb.